The Marañon Basin Technical Report was conducted by PARSEP, which is a joint venture between the governments of Peru and Canada. 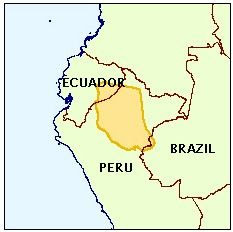 The Marañon Basin is a large sub-Andean Basin extending north from the Ucayali Basin, through Peru into Ecuador and Colombia where it is known as the Oriente and Putumayo Basins respectively. The Basin’s evolution begins in the Late Permian to Early Triassic with a major extensional event that dissected the underlying Paleozoic platform and basement into a series of NW to SE trending grabens and half grabens. In the western extremes, deep rift basins were formed containing sequences of continentally derived sediments that are overlain by a Triassic to Jurassic-aged marine to transitional (sabkha) unit dominated by carbonate deposition and evaporites. This in turn is overlain by regressive continental redbeds of Jurassic age. The eastern Marañon is very different with the remnants of the Late Permian to Early Triassic extensional event being persevered only as a series of half grabens that contain preserved sections of Paleozoic rocks within the lows. Early Cretaceous peneplanation stripped off most if not all, of the intervening sediments. The Marañon Basin started to take on its present-day form through a sequence of tectonic events that spans the Tertiary and culminated in the Miocene to near Recent with the Quechua orogeny. The present day western margin was formed through a complex combination of wrench related high angle faults, basin inversions and thin-skinned deformation fronts that now separate the Marañon Basin from the Santiago Basin to its northwest and the Huallaga Basin to its southwest. Geochemical studies in the Basin have recognized two significant petroleum source rocks that have generated the hydrocarbons found in the Cretaceous reservoirs of the Marañon Basin, the Cretaceous Chonta/Raya Fm. and the Triassic/Jurassic Pucará Gp. A long-range migration from these source rock kitchen areas to reservoir is implied for the accumulations found to date. A third less known source rock for the Marañon Basin is also present within the Devonian Cabanillas sequence. It however is confined exclusively to southeastern portion of the Basin. 3) Neogene time which generated a second pulse of mature oil and gas from the Pucará where Pucará hydrocarbon generation had not terminated and Cretaceous Chonta HC generation and migration. The later is an ongoing process that has continued through to the present. To standardize the Cretaceous stratigraphy of the Marañon Basin, regional cross-sections were constructed across the Basin. When seismic data was integrated into the stratigraphic interpretation, several important issues surfaced that were not evident with just well data. Significant changes in Cretaceous stratigraphy across the Marañon Hingeline, which was intermittently active through geological time. A significant Upper Cretaceous to Early Tertiary WNW-ESE trending wrench related extensional event that can be identified in the NW Marañon and Santiago Basins. The presence of a Chonta-aged patch reef in the north-central Marañon Basin. Exploration models in the Marañon Basin for last 20 years have been driven by the same concept. The critical criteria for defining Cretaceous exploration targets historically in the Marañon Basin, was the presence of paleo-structures. The logic behind this is sound in that the paleo-structures needed to be in place in the Early Tertiary, to catch the primary and principal pulse of Chonta generated oils. This concept has defined most of the exploration targets in Marañon Basin for the last 20 years despite the following, 1) Productive fields with no paleo-structure, 2) Paleo-structures too small to account for the amount of presently trapped oil, and 3) Present day structures with well developed paleo-structures that are dry or with insignificant oil columns. With these inconsistencies there are clearly other mechanisms at work. Where oil has been found in younger structures, the explanation is one utilizing the remigration of oil from an older breached or tilted structural accumulation. The shortcomings of the paleo-structure hypothesis are that it misses two very important issues, large-scale paleo-stratigraphic traps and paleo-structures that are no longer closed. As long as traps of both these styles were in place and proximal to the later developing Andean Late Tertiary aged structures, the remigration from these paleo-accumulations into younger aged structures is far from difficult to imagine. Obviously, some of these paleo-traps would be coincidental with the younger structures and others not. The key to exploration in the Marañon Basin is in the definition of paleo-traps, not just structures, and in the remigration route of that hydrocarbon during the Quechua deformation. The other shortcoming concerning past exploration activities in the Marañon Basin has been its focus on Cretaceous reservoirs. In this and a previous PARSEP study it became evident that carbonates of the Pucará Group represent viable exploration targets in the western Marañon Basin. In the SW Marañon for example there are only four Pucará penetrations. Of these, three intersected the Pucará in a non-prospective supratidal to continental facies and one well, the Shanusi 1X, intersected the Pucará in a prospective facie and encountered gas bearing porous carbonates. Our current model has the Shanusi 1X well penetrating high-energy intratidal carbonates along a paleo-high trend created by the late Permian to early Triassic rifting event. This is a potentially productive fairway that may be extrapolated to both the north and south of the well. Hydrodynamics have largely been ignored in the Marañon Basin despite the documented examples of tilted oil/water contacts. Through a hydrodynamic study sponsored by PARSEP, tilts are expected to be very severe in the western Marañon Basin where high hydrologic heads can be mapped near the highly elevated Cretaceous recharge areas in the fold and thrust belt. The effect diminishes to the east and southeast across the Basin and the measured data fits closely with what is observed in the fields. A second less dominant east to west flow can be documented in the eastern Marañon Basin which can be attributed to a preserved paleo-flow in pre-Pozo time. This has also influenced oil/water contacts in Marañon Basin. Hydrodynamics are clearly an important component to understanding the dynamics of the petroleum systems operative in the Basin.